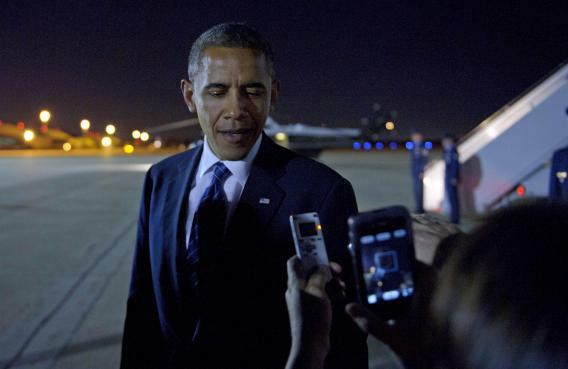 US President Barack Obama comments on the performance of Vice President Joe Biden in the vice presidential debate October 11, 2012 upon arrival at Andrews Air Force Base in Maryland. Frank Foer and Chris Hughes sit down with President Obama, proving my adage that the friendly interview is usually better than the hostile interview. The subject, especially if he’s a politician, has prepared for the hostile interview. The friendly interview poses new, random challenges. In this talk, Obama agrees with the liberal punditocracy and says the Republican House is driven, by gerrymandering and media factors, to be unreasonable. One of the biggest factors is going to be how the media shapes debates. If a Republican member of Congress is not punished on Fox News or by Rush Limbaugh for working with a Democrat on a bill of common interest, then you’ll see more of them doing it. Greta Van Susteren, who’s not really seen as one of the “conservative” Fox News hosts, responds with… kind of just a bunch of Republican talking points. A Fourth Amendment stunt turns out the right way. Brian Doherty on how the free market thinkers won the long game. A new gang of Eight comes together on immigration reform. And Conor Friedersdorf’s guide to 2012’s longform and medium-form narrative nonfiction includes a bunch of winners.